The Te Mataili II patrol boat as seen from Austal's shipyard in Fremantle, Australia. Photo c/o Ship Spotting by Brian Wayne Scott. The Tuvalu government received its Guardian-class steel-hulled patrol boat to help secure its maritime borders. The boat will be operated by the Tuvalu Police Force’s Maritime Surveillance Unit. 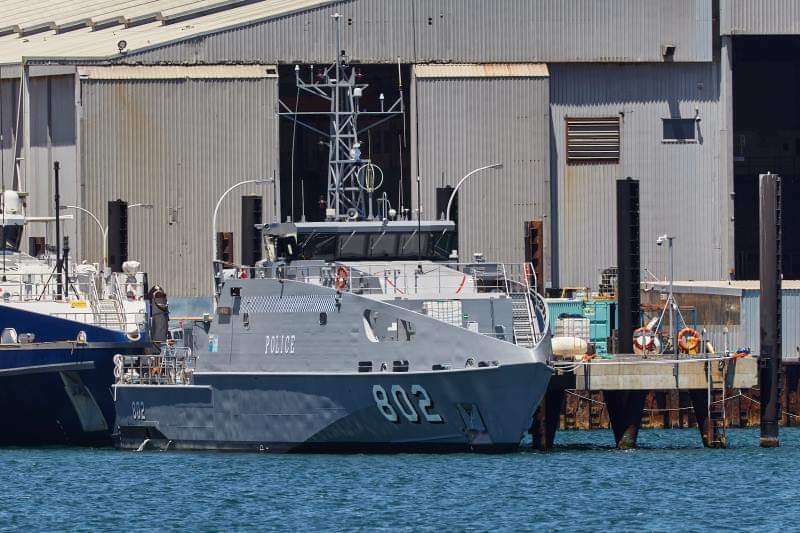 The boat, named the Te Mataili II, was gifted by the Australian government as part of their Pacific Maritime Security Program – Pacific Patrol Boat Replacement project and part of the Royal Australian Navy’s A$350 million SEA 3036 program. The project is Australia’s commitment to enhance the maritime security capabilities of 13 of its immediate neighbours of mostly small island countries in the Pacific, plus Timor-Leste. 21 patrol boats are to be donated as part of the program. As part of the agreement, the Tuvalu government will return the original patrol boat gifted to them by Australia, the Te Mataili, for recycling once the new Guardian-class patrol boat becomes operational. The Guardian-class is built by Australian shipbuilder Austal, with an overall length of 39.5 meters, a beam of 8 meters, powered by 2 Caterpillar 3516C diesel engines, and has a top speed of 20 knots. It has a crew of 23 men, and was designed to allow a naval gun of up to 30mm calibre, and for port and starboard side 12.7mm heavy machine guns. Tuvalu was the second country to receive the Guardian-class, with the Te Mataili II being the second ship of the class. Aside from the Tuvalu, twelve other countries are expected to receive similar patrol boats from Australia, composed of the Cook Islands, Fiji, Kiribati Islands, Marshall Islands, Micronesia, Palau, Papua New Guinea, Samoa, Solomon Islands, Timor-Leste (East Timor), Tonga, and Vanuatu.